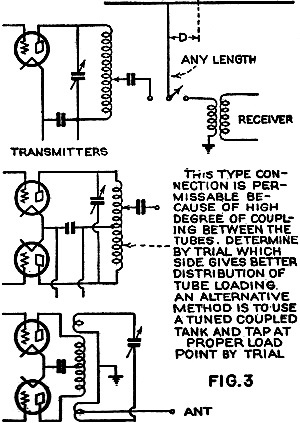 One of the nice things about antenna design articles is that regardless of when they were written, all that is needed to make them entirely contemporary is to substitute a transistor schematic symbol for a vacuum tube and substitute the units "kHz" and "MHz" for "kc" and "mc," respectively. If the article delves into detailed circuit design, a substitution of "μF" for "mf" might also be required and depending on the frequency range, "pF" for "mmf" or "μμF." Some readers might feel the urge to replace SAE units with metric units, but even a hundred years ago there were people who needed to do that. 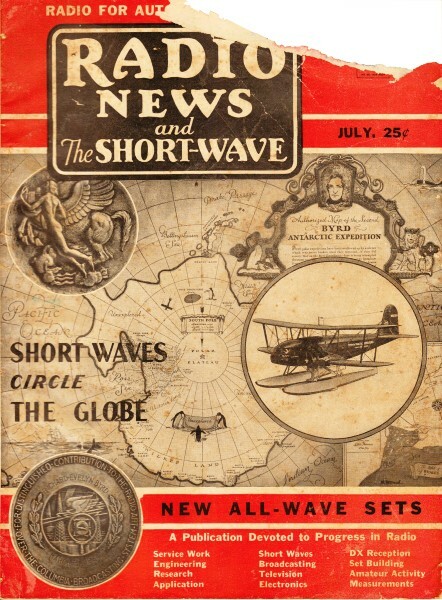 "Aerial" and "antenna" are still interchangeable in modern radio parlance. 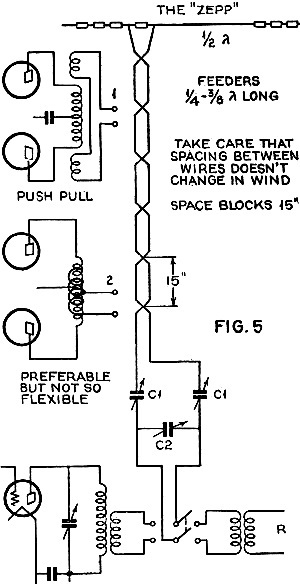 With that in mind, please enjoy this 1934 article on basic antenna design. The type of antenna system to be used for amateur short-wave work is of secondary importance and depends largely upon the individual location and the frequency bands to be covered in regular operation. Some types are easily adapted for multi-band work while others are suited to only a single frequency band. In general, the latter types are somewhat more efficient but not obviously so. The object of this article is to bring together some practical information to help in choosing the most suitable antenna system for particular cases. Better efficiency usually results in using a Hertz antenna (1/2-wave wire in free space) than when using the 1/4-wave Marconi type which must have a good ground system or a large counterpoise. (In this latter type every inch of wire in the system radiates energy, so that a rather small percentage is radiated by the uppermost parts of the antenna which do the business.) The horizontal Hertz, on the other hand, is entirely up-in-the-air so it becomes obvious why the efficiency is better. And, of course, this applies equally well to signals coming in. Antenna systems for single-waveband operation will be first considered. This simple half-wave antenna diagrammed in Figure 1 is a split doublet, each side being one quarter wavelength long. The length of each half equals 0.78 times the wavelength or 468 / (2 x frequency [mc.]). It is ideal for portable work at any frequency and does a first class job for both transmitting and receiving. 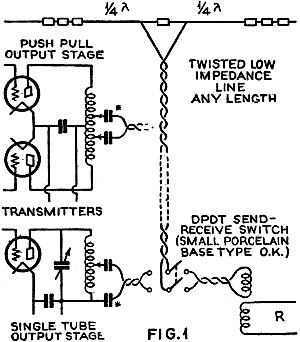 The transmission line used to couple this doublet to the transmitter or receiver need not be tuned and can be of any length provided its impedance is correct. Forms of rubber-covered, twisted lamp cord provide a suitable impedance match. "Giant Killer" feeder wire is intended especially for this purpose. Its impedance is slightly higher than that at the center of the antenna (about 75 ohms) so that it should be fanned somewhat when connecting to either side of the center insulator to be theoretically correct. This type of antenna is suited only to the waveband (fundamental) for which it is cut or any odd harmonic thereof. On even harmonics a voltage (and impedance) maximum appears at the center and cannot be matched to (is virtually short-circuited by) a 75-ohm line. When used for receiving, the line will have no pickup and, therefore, a maximum signal-to-noise ratio will result. The line is magnetically coupled to the receiver by means of a small primary coil; to the transmitter across a few turns of the last plate-tank coil or coupled same as receiver. Bear in mind the necessity for sufficient insulation in the twisted line when used for transmitting. The distance (S) equals one-quarter the antenna length for a 600-ohm line, and decreases as the line impedance goes down. See table in Figure 2. A transposed line may be used and is particularly desirable for reception. The line should be perpendicular to the antenna for at least 1/4 wavelength and should be terminated in such a manner at the transmitter so that it is balanced to ground. Transposition blocks make an easy and efficient job of the feeder. In putting up this type of antenna, the wire should be several percent too long and should be cut about one percent at a time, observing the performance after each cut. Fixed coupling to the transmitter (or an oscillator) should be used so that the loading effect of the antenna might be seen on the plate (or grid) milliammeter. When the doublet length is correct, it will have a maximum load effect. A third type of antenna for single-band operation is the single-wire feeder affair shown in Figure 3. The length of the antenna is roughly the same as the previous type but had better be determined by experiment, as previously explained. The feeder should be connected one-seventh the length off the center and must run at right angles for proper operation. There must be no sharp bends in this feeder or there will be reflection losses and line radiation. This type is less suitable for reception than either of the foregoing systems because the line is not so free from pick-up. In the foregoing antennas, properly designed and constructed, there should be no radiation or pick-up on the feeder and any length at all may be used. If no radiation or pick-up takes place in the feeder, the half-wave antenna is doing all the work, which is exactly what we want. And in this case there is a marked directionality, best transmission or reception being at right angles to the line of the antenna. In adjusting these antennas to the transmitter, the plate meter must be used as the antenna current in the feeders is very low and is not necessarily a true indicator of power taken by the antenna proper. Start with a minimum of coupling and gradually bring it up, always retuning the plate-tank condenser, until the tube is properly loaded. It is possible to use any of these types as a Marconi antenna for lower frequencies, tying the two feeders together. In a pinch this means may also be used on odd harmonics of the Marconi quarter-wave fundamental but, at best, is a makeshift job. The single-wire-feed antenna of Figure 3 may be used for all amateur frequencies but does not perform as well on harmonics as on the fundamental frequency. This is because there is a mismatch between antenna and feeder on harmonics. It is possible to compromise and improve harmonic operation but usually at the expense of fundamental efficiency. The feeder is usually moved further from the center of the antenna. The feeder radiates, standing waves appear and there are losses all around. Nevertheless, many hams like this method because of its utter simplicity and obtain good results with it. It should be cut for the lowest frequency band to be used or, if this demands too great a stretch. Marconi operation may be used on the highest wavelength, the antenna being cut for one band lower. A second all-band antenna may be procured by simply cutting any single wire (plus lead) into a half-wavelength for the lowest frequency band to be used. Operation with a ground may also be used as above. This is really a voltage-feed type with a feeder of zero length. The end of the antenna is plenty "hot" and should therefore be hung close to the plate on the tank coil. A separate tank of low capacity (to reduce losses) may be coupled to the plate tank and the antenna hung on to that. 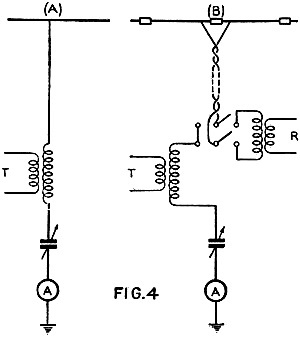 A ground is sometimes used at the other end of this coupled circuit. However, some losses are bound to appear as the antenna comes into the shack and into the vicinity of other apparatus. Not only that but there is a strong field around the antenna which may be a nuisance - affecting neutralizing, paralyzing the receiver, etc. Of course, the entire length of wire radiates so that a lot of energy may be wasted before it gets to the high part of the system. The length should be adjusted experimentally as with previous systems because the antenna proper, coming into the shack, is subject to all kinds of influences which might affect the fundamental, or natural frequency. This antenna is equally good on all harmonics because the ends of an antenna are always maximum voltage points (Figure 4). A third type, permitting many-band operation is the old, reliable "Zepp," (Zeppelin) which is about the easiest antenna to resonate because a certain amount of tuning may be done right at the transmitter or receiver. See Figure 5. 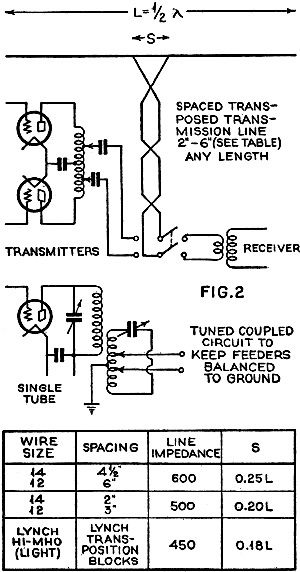 A half-wave antenna is used with quarter-wave feeders. This might be considered a full-wave affair with half a wavelength "folded," so that a point of maximum current comes right at the feeder end. This is a true current-fed antenna, the losses appearing in the previous voltage-fed system being entirely absent here. Although the feeders must be a quarter-wavelength long, electrically, much leeway is possible by loading or cutting with parallel or series-tuning condensers. When multi-band operation is desired, a compromise in length must be made to accommodate tuning to the various harmonics, the most reasonable length being a little under three-eights wavelength. This is not at all critical, compared to the chopping of the flat tops for this family of antennas, but should be quite close. 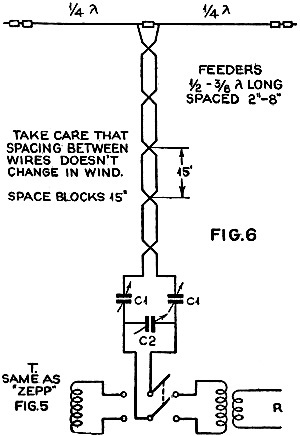 This limitation of feeder length which appears here for the first time in this series of antenna systems, might be worse were it not for the fact that the feeders may be bent or folded to add length. Again, the half-wave flat-top might well be cut too long and chopped although this is less important with the Zepp than with most of the other types. Most hams do not get a proper balance of feeder currents so the feeders do some radiating. Even so, the results obtained usually justify this old favorite. It is because some leeway is possible that they don't take the necessary pains to do n perfect job. This is really an unbalanced system, but it does a lot toward improving the signal-to-noise ratio, especially when transposed feeders are used. However, in our opinion, the following antenna is really the ace of all wave receiving aerials. Figure 6 shows another very flexible system. this time a balanced "split" arrangement that resembles the first shown doublet, but which is really a one-and-a-half-wave antenna with two half-wave parts, folded as feeders. Since a current maximum exists in the center of the antenna we need half-wave feeders this time, to get back to another current maximum for current feed. Again, compromising in feeder length for the sake of the harmonic family, the feeders should be the same length as in the Zepp. This will allow tuning to all bands in a similar manner. In both this type and the Zepp, the full voltage of the antenna appears on the feeders, so that the spacers must be first-class insulators and of low dielectric constant. When a transposed line is used this antenna is excellent for reception. although tuning must be used! This is the most versatile aerial of the whole bunch for multi-band use and will cover a large part of the short-wave spectrum. To correct a common fallacy, solid wire has not the lowest high-frequency resistance but, rather, a sort of cable made of insulated wires, tightly twisted together, presents a much lower resistance than the equivalent solid wire.